Weaker than anticipated job creation in August, combined with downward revisions to the previous two months’ figures, reinforces the fragility of the economy. 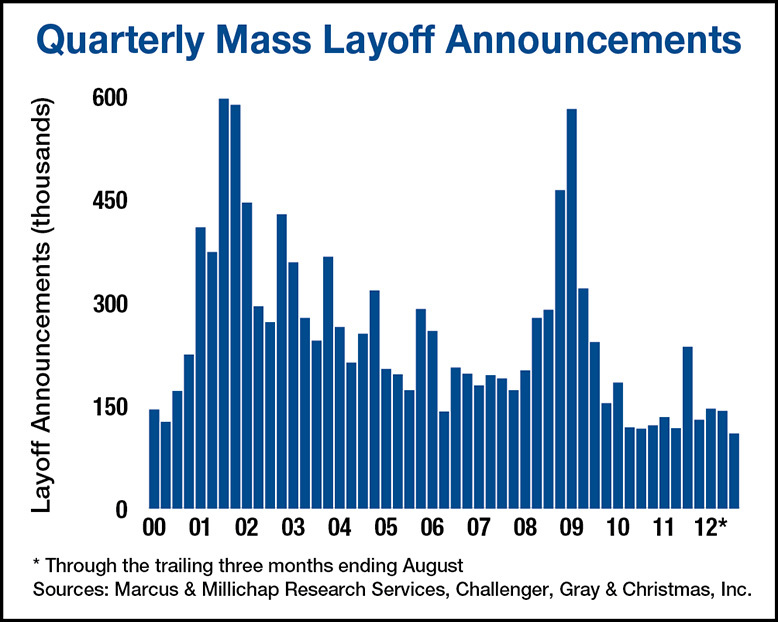 Although last month’s results reflect slower hiring instead of increased layoffs, uncertainty surrounding the election and the approaching fiscal cliff are holding many employers at bay. Manufacturing, one of the brightest spots of the recovery, was beset last month by waning exports to Europe as many eurozone countries have re-entered recession. In recent months, the Federal Reserve signaled that it is prepared to launch another round of quantitative easing to stimulate the economy should it be needed. With the August jobs report in hand, the FOMC will likely take action at its next two-day meeting slated to start September 12. Private-sector employers added 103,000 workers last month, offsetting a loss of 7,000 government jobs and leaving a net gain of 96,000 positions. Gains were broadly distributed, with seven of 10 private employment sectors expanding payrolls during the month. Leisure and hospitality added 34,000 workers as hotels, bars and restaurants in Charlotte and Tampa prepared to host political conventions. Trade, transportation and utilities staffing grew by 29,000 jobs, with retailers adding 6,100 employees for the back-to-school shopping season and the upcoming holidays. Manufacturers, however, trimmed 15,000 jobs in August, all in the durable goods segment. The loss interrupts a sustained period of growth, as manufacturers added 421,000 positions in the past 24 months. As the FOMC prepares to meet next week, the job market sits in a suspended state. More than 3.7 million positions were open across the nation at midyear, the highest number at any point since the recession ended. However, employers remain either unable to find qualified candidates to fill positions or reluctant to commit to adding permanent workers with the election and possible federal spending cuts unresolved. Though the pace of hiring remains slow, employers are not trimming payrolls to the extent seen during periods of expansion. Mass layoffs fell to the lowest level last month since December 2010 and the year-to-date total is lower than at any time in the past 10 years. The national office sector is charting a sluggish recovery despite positive employment trends. Full-time office-using employment jumped by 42,900 workers last month and more than 455,000 employees over the past year, but job growth has yet to translate to significant new demand. Full-time positions added over the 12 months ending in the second quarter generated only 55 square feet of net absorption per worker, down from 78 square feet per worker at a similar point in the last economic recovery. Subpar demand growth will underpin a scant 40-basis point drop in vacancy this year to 16.9 percent, while effective rents will grow 2.7 percent. Even the lackluster pace of job growth this year continues to sustain the creation of new rental households. Within the prime renter cohort spanning the ages 20 years to 34 years, the unemployment rate has declined 90 basis points this year to 10.1 percent. The decrease contributed to a 50-basis point drop in national vacancy in the first half to 4.7 percent and supported a 2.1 percent bump in effective rents. Steady demand and minimal construction will slash vacancy 80 basis points to 4.4 percent this year, the lowest year-end level in the past 10 years, while effective rents will advance 4.9 percent. This entry was written by marcusmillichap, posted on September 8, 2012 at 12:46 am, filed under Research and tagged Commercial Real Estate, Employment. Bookmark the permalink. Follow any comments here with the RSS feed for this post. Trackbacks are closed, but you can post a comment. Great information guys. These numbers shall help us in the industry understand the market better. yours is the greatest I’ve discovered so far. However, what concerning the bottom line? Are you positive concerning the source?